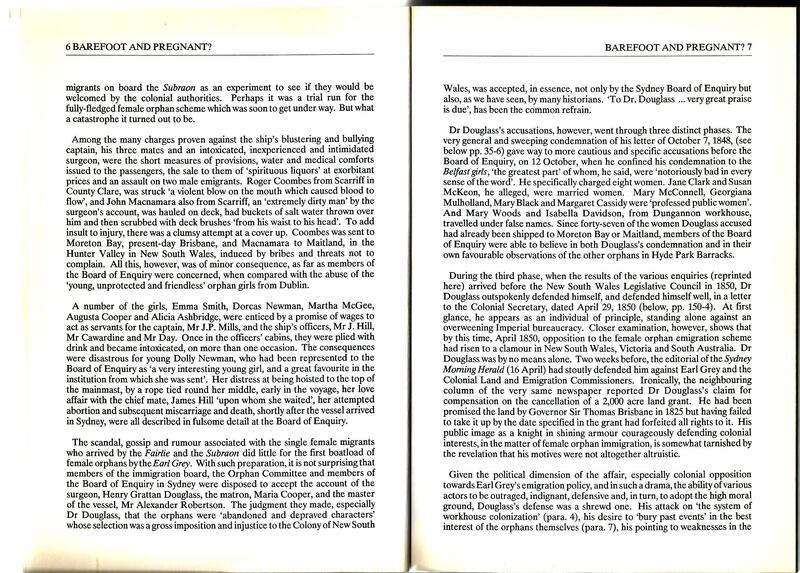 Here is the next installment of the 1991 introduction to my Barefoot & Pregnant? volume 1. It’s pages 6-11 this time. I’ll use the occasion to ‘dip my lid’ to the brilliant Jaki McCarrick. Her play “Belfast Girls” is soon to have its Canadian premiere in Vancouver in March this year, having had a wonderful run in London and Chicago already. There is a bit about it on the ‘Peninsula Productions’ facebook page, should you want to find out more. As with the last couple of posts, I’ll try adding endnotes missing from the original a bit later, once i find the correct reference. You can make the photographic image larger by clicking a couple of times or ‘pinching’. The scandal surrounding the Subraon is not well known. However, if you take the trouble to read the very thorough enquiry of the Sydney Immigration Board you will understand more clearly how they would react to the furore associated with arrival of the first official Orphan vessel, the Earl Grey. Have a look at the extracts below. Mr Acret‘s further statement. (Acret was the Surgeon-Superintendent on the Subraon) . “From the evidence which I have in the course of this enquiry respecting it, I am satisfied that Dorcas Newman had a miscarriage; had I been aware that such was the fact I should have treated her illness differently from what I have done…”. Later that year, 26 October, the Subraon was wrecked at the entrance to Wellington Harbour. The Sydney authorities had successfully kept a lid on the scandal surrounding the vessel’s voyage to Port Jackson. Both ship’s officers and the Surgeon were in no position to object. It would be a very different matter when the Earl Grey and Surgeon Douglass arrived early in October 1858. The major source for the documents surrounding the Earl Grey furore is the Votes and Proceedings of the Legislative Council of New South Wales (hereafter VPLCNSW) 1850, volume 1, pp.394-436. (Incidentally, information on the Subraon follows at pp.437-45). The material in British Parliamentary Papers (BPP), Irish Universities edition, Colonies Australia, vol 11 Sessions 1849-50, pp.417-20 and pp. 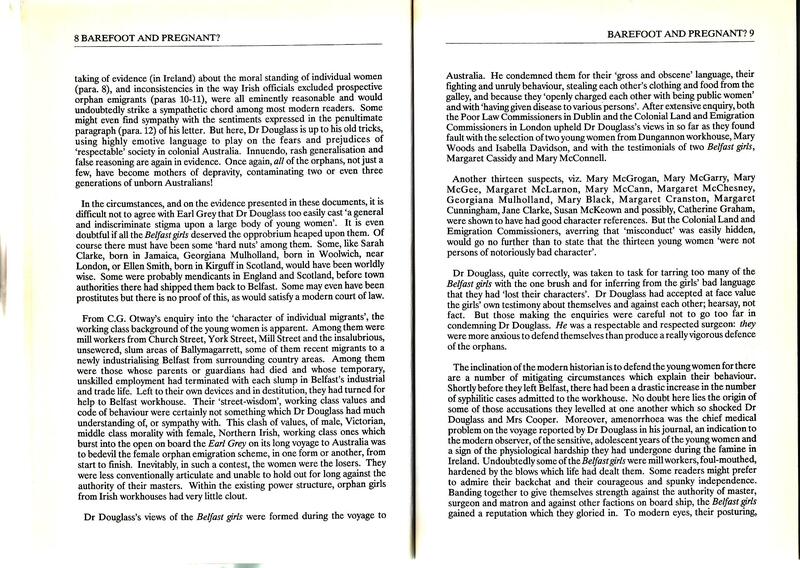 510-40, will also provide the names of the ‘Belfast girls’ Douglass accused of bad behaviour. Pages 417-18 reprints Douglass’s letter of 7 October 1848. Dr Douglass continued to petition the New South Wales Parliament for restoration of his land. See SMH 7 September and 19 September 1852, page 2 in both instances. RE Mary Campbell Belfast Board of Guardian Minute Book B.G.7/A/7, p.159. The Minute Books help us put the orphans into historical context. In this same volume, for example, page 27, 1 March 1848, we learn of the diet for able-bodied inmates. Supper 4 oz meal one third qrt buttermilk. Indian and oat meal used in equal proportions.” And this was one of the better off workhouses! ‘Sarah Butler one of the candidates for emigration to Australia has been rejected by Mr Senior on account of her being affected with itch‘. Coleraine BG Minute Books B.G.X/A/6, p.165. The Medical Officer, Dr Babington was also asked to provide the emigrants with a medical certificate stating they were healthy. The same page also gives the names of twelve young women from Coleraine workhouse who would travel on the Roman Emperor to South Australia. It is always worth looking at the original sources. This entry was tagged "Belfast Girls", Alicia Ashbridge, Belfast workhouse dietary, Board of Guardian Minute Books, C.G. Otway, Captain Mills, Dolly Newman, Earl Grey, Earl Grey orphans, Henry Grattan Douglass, Irish Famine orphans, Irish Famine orphans to Australia, Jaki McCarrick's "Belfast Girls", Mary McConnell, Subraon, Surgeon Frederick Acret, Sydney Board of Immigration. Bookmark the permalink. Hi Trevor, The reproductions look great to me. All the best.